Supporting community and social participation through a range of group and individual supports. 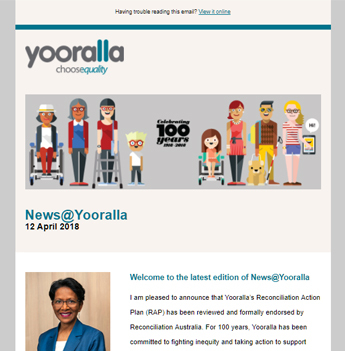 Yooralla provides community-based supports for people with disability, where every individual is encouraged to pursue their goals by accessing skills-based learning, recreation and social activities. Working together with you and your family or support network, Yooralla will create a personalised plan around your goals and aspirations, and identify the programs and supports that will assist you to achieve them. Support can complement your existing informal supports, such as your family, friends and other community members. Yooralla caters to many different needs and interests in a safe and supportive environment, both within the hubs and in the local community. Our qualified staff take a person-centered approach, and are committed to providing innovative and stimulating programs and activities designed to enhance your life skills and promote choice, inclusion, independence and wellbeing. With Hubs, or meeting places, across Victoria, where you can receive the support you require, meet new friends and get out in your local community, all while learning new skills. We can support you with whatever you’d like to do… everyone is different! We provide flexible, on-demand supports including after hours, weekends and holidays. For more information on how Yooralla can assist you to increase your community and social participation, please contact us.